Eagle Tire Pros in Jacksboro, Tennessee. When passion pulls you in a certain direction, it’s hard to ignore. Tony Johnson never thought he’d be in the tire business, “but it was one of those things that came naturally to me,” he recalls. At age 6, he would sit beside his dad in his pickup as they drove north to salvage tire casings and used tires that his dad would then sell to his employers at the recap shop. When he made enough money, his dad opened his own shop where Tony would change tires at age 10. And at 19, he borrowed $3,000 from his dad to become a one-man band starting his own used tire shop. Driven by an entrepreneurial spirit and the desire to do things right the first time, Tony has owned a few shops, sold a few and been thousands of dollars in debt. But this self-proclaimed “conservative gambler” has more than earned his spot as a Tire Review Top Shop Finalist this year. Tony thought he wanted to be a law enforcement officer. So at 18, he left home to start college and majored in criminology. But after the first semester, he realized it wasn’t for him. “I really knew about cars, and I regained my passion for working on vehicles,” he explains. So, he dropped out of college, borrowed $3,000 from his dad and bought and opened a used tire shop in Middlesboro, Kentucky. For about two years, he ran the shop, driving an hour there and home to Jacksboro each night on a narrow, one-lane country road after exhausting workdays alone in the shop. Realizing he wanted to stay closer to home, he sold his Kentucky shop – now D&D Tire Pros – to a college buddy looking to switch careers. Finally, he bought some land at an auction, which would eventually become the site of the first Eagle Tire Pros. 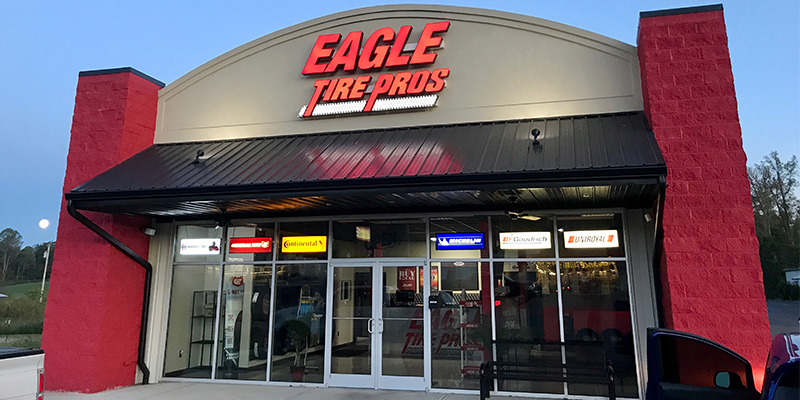 Eagle Tire Pros moved into its current store in Jacksboro, Tennessee about a year and a half ago. The nine-bay facility brought in $1.5 million in total gross sales last year. As business grew, so did Eagle Tire Pros, which quickly went from a four-bay shop in 1996 to a six-bay shop by 2001. Yes, Tony’s a conservative gambler, but he knows that more bays equals more revenue. So about a year and a half ago, the shop moved into a new, nine-bay location with an exterior lift, and the investment has paid off. Just last year, Eagle Tire Pros brought in $1.5 million in total gross sales. Like his father before him, Tony brought his son into the family business. Brandon Johnson, the shop’s chief operating officer, has taken over much of the marketing and financial duties. And like his dad, Brandon vowed that he didn’t want to go into the family business. He received bachelor’s degrees in marketing and management from East Tennessee State University and went on to get his MBA there. With an interest in politics, he started running political campaigns and was a grassroots community organizer for conservative groups after graduating, but something was missing. 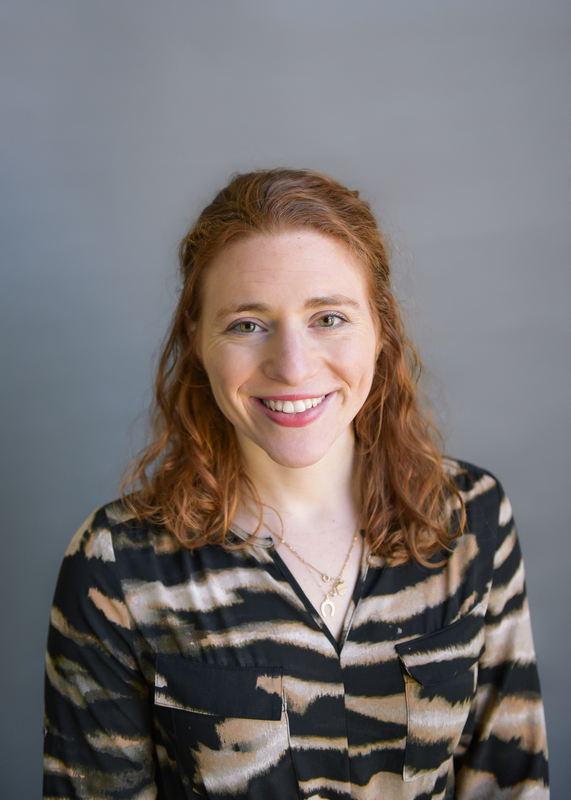 “I got really tired of politics after working in it for so long, and I complained a little too much one day, and dad said ‘You want to come back to the family business and give it a try?” Brandon explains. Now, Brandon is ingrained in it. He not only works the counter, explaining tire options and different repairs to customers, but he also has taken over the shop’s marketing, increasing its presence on Twitter, Facebook and Instagram, and he’s constantly looking for ways to build on his father’s 22-year legacy. 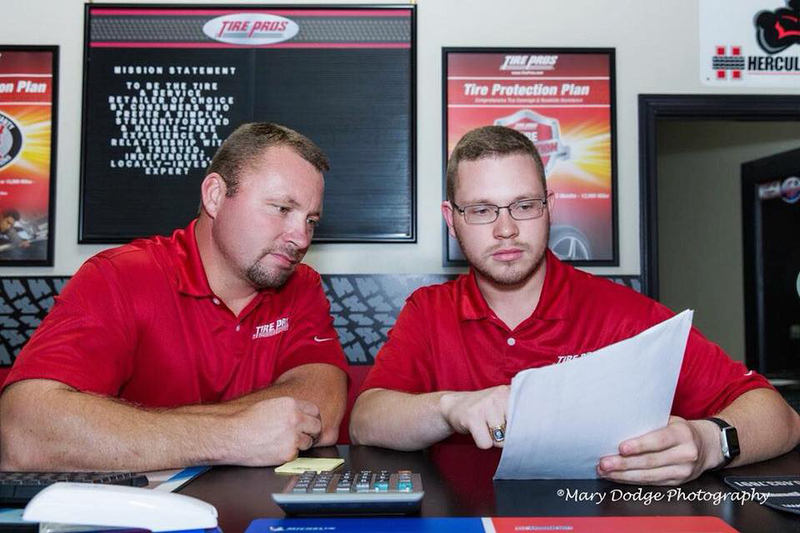 Eagle Tire Pros owner Tony Johnson (left) works with his son, Brandon (right), the shop’s chief operating officer. 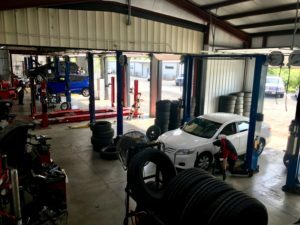 Currently, the duo is solidifying the shop’s procedures to one day expand and implement them at Eagle Tire Pros shops in neighboring counties. The shop still does its fair share of print marketing and commercials, but, Brandon says, its strongest return on investment is in digital. Overcoming the challenges to make Eagle Tire Pros the success it is today has taught Tony to create a successful customer experience. That’s why Eagle Tire Pros offers a tire protection plan that includes free flat repairs, rotations, inspections and air pressure checks. It also has a 30-day window for customers to return tires if they’re not happy with their purchase. In addition, the shop has a large waiting area with refreshments and Wi-Fi, and a shop van “dubbed Old Faithful,” that gets customers with longer wait times where they need to be. Another perk? Easy drop off. If a customer’s vehicle is dropped off overnight, it’s monitored by a camera system to guarantee safety. “I’ve never encountered any business owner as accommodating as Tony,” says Daniel Byrd, one of the many customers that crosses county lines to get his automotive work done at the shop. “I want to give special thanks to the Eagle Tire Pros team for helping us with our gender reveal party,” writes customer Jennifer Hanson, who had tires installed on a yellow Corvette to create pink smoke during a burnout. 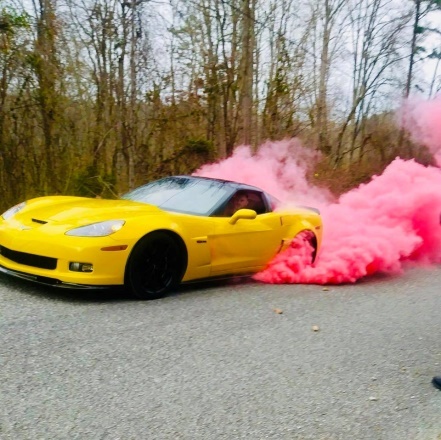 Eagle Tire Pros doesn’t shy away from any job, including installing gender reveal tires on a customer’s vehicle. Tony has invested as much in his shop as he has in its talent. All of his techs have at least one ASE certification and one TIA certification, and one employee is an ASE Master Technician. His management and sales teams are all TIA certified and hold several tire manufacturer certifications. He also encourages team building and fun. Most recently, the Eagle Tire Pros team got together to submit a crash derby car to the Tennessee Valley Fair. Paired with that, Tony stresses the importance of honest communication – not just between team members but also between the shop and its customers. Tony has coached the Eagle Tire Pros team to even take customers out to the bay and show them what’s wrong with the car and how they’re going to fix it. He makes sure he over delivers on his promises. 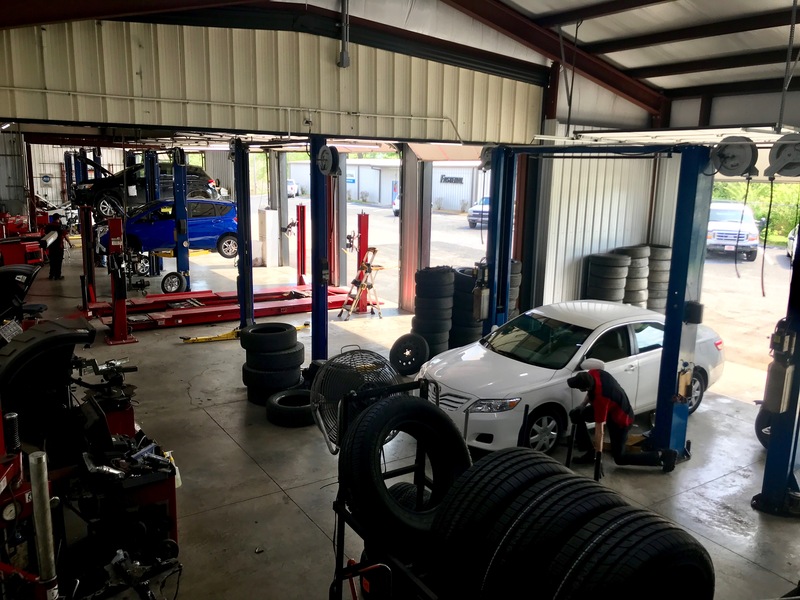 The 30 customers per day the shop serves and the 60-80 phone calls it fields per day are evidence of his steadfast commitment to make sure Eagle Tire Pros takes care of each customer’s needs. Currently, Tony’s role in the shop is to oversee operations – whether it’s walking around the shop chatting with techs about certain jobs or jumping in on a conversation with a customer to better explain the necessity of a repair. Many times if you walk into Eagle Tire Pros, Tony or Brandon will take you through what work your car needs. But aside from daily duties, the shop has also been put on the national stage. With its visible digital presence and new store design, the Tire Pros franchise selected the store as the site of its new, 90-second commercial touting its “Hassle Free. Guaranteed.” approach. This is just the tip of the iceberg for this father-son duo. In the last year, they’ve been honing in on perfecting their processes and procedures to open more shops in the area, maybe for a future expansion to neighboring counties.